Canadian angler Allen Babakhani caught this 18.71-kilogram (41-pound 14-ounce) common carp (Cyprinus carpio) on June 2, 2018 while fly fishing Lake Erie in Ontario, Canada. If approved, this catch will become the new men’s 4 kg (8 lb) tippet class world record which currently stands at 15.98-kilograms (35-pounds 4-ounces). 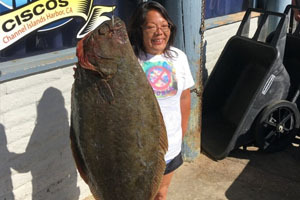 Angler Debbie Sharp potentially set the new women’s 15 kg (30 lb) line class world record for California halibut (Paralichthys californicus) with this impressive 20.44-kilogram (45-pound 1-ounce) fish that she caught on May 8, 2018 while fishing off Santa Cruz Island, California. Sharp needed only five minutes to subdue the potential record halibut after it ate the squid she was fishing on the bottom. If approved, the catch will replace the existing record of 18.59-kilograms (41-pounds). Finnish angler Tomi Valkamaa caught this quality 4.36-kilogram (9-pound 10-ounce) zander (Sander lucioperca) on May 21, 2018 while fishing outside of Saltvik, Finland. Valkamaa needed only a few minutes to land the potential record zander after it ate the jig and soft plastic combo he was fishing. 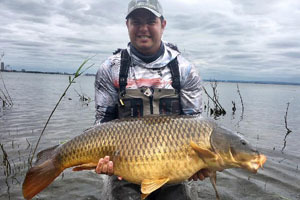 If approved, the catch will become the new men’s 3 kg (6 lb) line class world record, which currently stands at 2.95-kilograms (6-pounds 8-ounces). 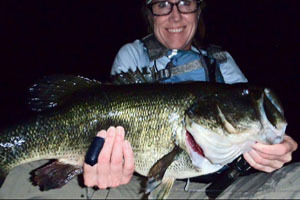 Angler Kesley E. Gallagher potentially set the new women’s 4 kg (8 lb) tippet class world record for largemouth bass (Micropterus salmoides) with this 2.49-kilogram (5-pound 8-ounce) largemouth that she caught and released on April 9, 2018 while fishing Westlake Lake, California. If approved, the catch will replace the existing record of .68-kilograms (1-pound 8-ounces).